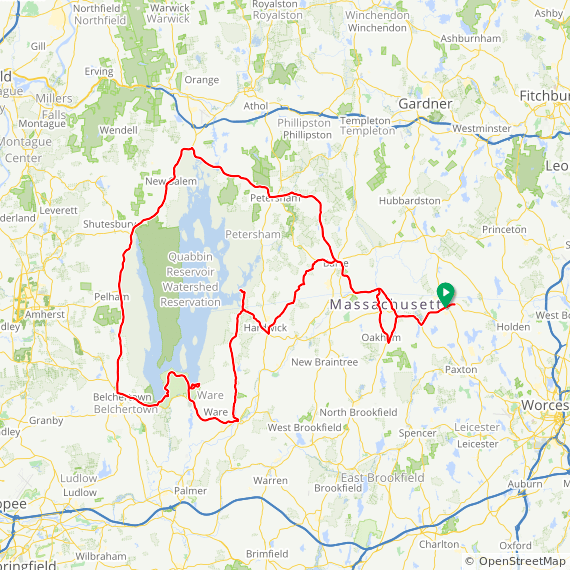 The King’s Tour of the Quabbin is a Seven Hills Wheelmen annual century ride around Quabbin Reservoir in western Massachusetts, starting from Rutland Masachusetts. 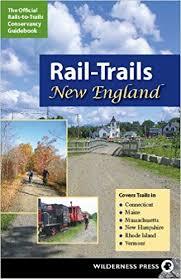 The route goes northwest to Barre, then clockwise around the Quabbin Reservoir. A rest stop with water and snacks is at mile 22 on all routes. The metric century splits off at mile 34 in Ware and returns via the Gilbertville covered bridge. The 100-miler and the 125-miler go into the Quabbin Reservation in Ware and climb to the summit tower; the Visitor Center at mile 43 at Winsor Dam has water and bathrooms. The two long routes diverge at mile 49 in Belchertown, where there is a convenience store. The double metric goes into North Amherst, and the 100-miler goes up roller-coaster Route 202 to New Salem, which has a convenience store at mile 67. The two long routes converge shortly before the Petersham rest stop (mile 76 on the 100-miler and mile 101 on the 125-miler).All routes are hilly. Cue sheets from the Wheelmen for the Century and Metric Century are below.